Here she is at Disneyland in Anaheim toward the end of 2003. 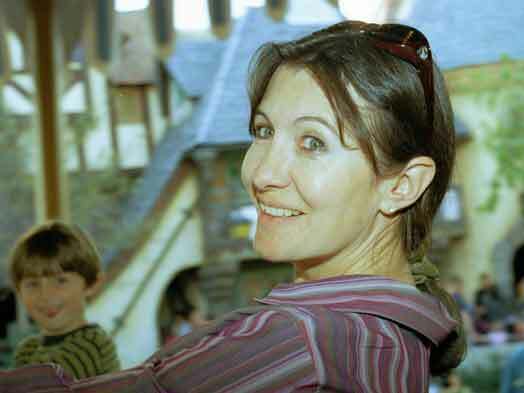 Alex can be seen a little out of focus in the background, and in a very cute photo on the same roundabout at the top of the Carousel of Time page. I have to admit that it would be very hard for me to paint any kind of complete and balanced portrait of Marie-Hélène at this point, even a miniature one. In part, that is because we are now divorced, and I’m not really objective, at least not for the time being. In part, it is because I’m not sure that I ever knew her well enough to paint such a portrait. 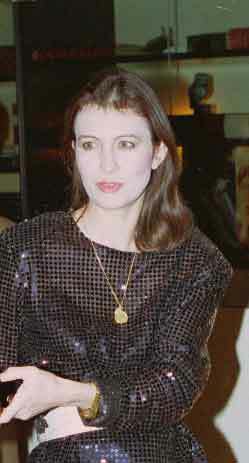 At a cafe in Carmel on her birthday in 2001. But there are a lot of things I can say, and the most important in this tapestry of our beautiful family is that the family itself came to pass because I fell in love with her and, a couple of years later, after each of us repeatedly took three steps forward and then two steps back, she fell in love with me. That was such a wonderful time, the period when we were falling in love. Every day revolved around her, would I see her, should I call her, what should we do next, why did she do that, did I do that right, was everything okay? Oh yes, it was. 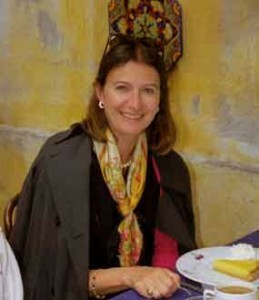 I had met her on March 2, 1987, my first day at Kevorkian & Rawlings’ Paris office. She was the office manager, and definitely the most attractive woman there. I paid attention, but not a lot more, for years. As time passed, I grasped the basics, in the same way that you get to know anyone you work with for several years: nothing in any real depth, but a feel for who she is. 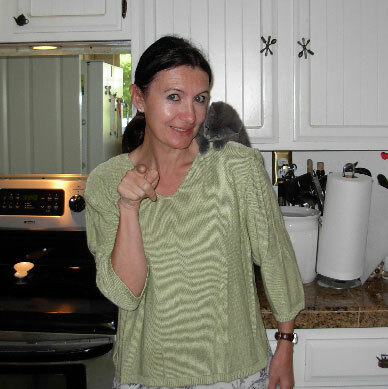 In the kitchen at home in Santa Cruz in 2007, with Pucci, one of our dearly-loved kittens, on her shoulder. Having lived almost all of her life in Paris, she was and is a “parisienne,” a Parisian woman with impeccable and apparently effortless dress sense, and a knack for taking care of herself and looking good. She never spent a lot on clothes or make-up, but you could never tell: she always looked as if she had. Raised and educated with the occasional duchess and millionaire, her values too are Parisian and, dare I say it, sometimes a little bourgeoise. That tendency is tempered and kept in check by the other facet of her upbringing, her bohemian parents, her father a photographer and her mother a painter. They lived in the 17th arrondissement, a wealthy enclave, in a pierre de taille building, but the building backed onto the railroad tracks coming out of St Lazare. I liked the balance. 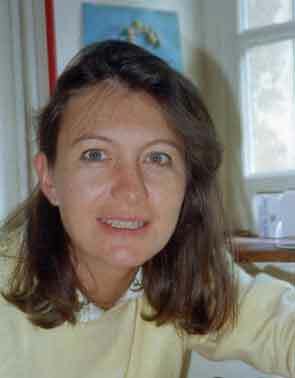 At Le Tahu, Christmas 1994. Les Berhauts, Marie-Hélène, her brother Denis and his wife Chantal and their family, and her father Jacques all elected formal attire for dinner that Christmas Eve, and very elegant they all were. I took this reserve to be the French equivalent of the English stiff upper lip. You stay on top of things, on top of your own emotions, in order to convey or develop a kind of strength. I’m not a great believer in that kind of strength, but respect it in others. Not surprisingly, there were no sparks at all between us during those years of severely limited communication. Then suddenly, late in 1991, she started opening up to me. Her mother had passed away by this time, but it wan’t about her mother that she abruptly started talking, it was about Pierre, her beau and the father of her two children. She started revealing the hurt that she seemed to have been feeling most of the time that we had worked together. I had seen it in her face on and off for years, and knew that it was serious, just as I had known for the longest time that it was none of my business! Quite suddenly, it became my business, in conversations in the office that first came out of the blue and then became a new norm. Charlie was born a couple of weeks before this photo, taken in 1995 in the kitchen at Le Tahu. She revealed, laughing, that Pierre regularly disappeared overnight, and the only thing that she knew for sure about these disappearances was that he did not go where he said that he was going. Again, that laughter looked to me like a stiff upper lip and then some: denial upon denial. Where was he going overnight? Why did he enable her to realize that he never went where he said that he was going? The French are masters at being discrete when they wish to be. Why didn’t he wish to be? Pierre had apparently fathered a child with another woman, his prior girlfriend, between Daphné and Alban. I had to think long and hard about that one. The French have turned infidelity into an art form, one that can be very cruel, but this was extreme even for Paris. Not only did this boy oblige her to deal with Pierre’s infidelity, it gave her a permanent reminder of it, as long as the child was around. He is Daphné’s and Alban’s brother, and thus he would always be around. The boy’s mother had brought him over to Marie-Hélène’s street in Paris before Pierre had admitted to what he had done. When she saw the baby flaunted on the sidewalk outside her parents’ apartment windows, Marie-Hélène knew for a certainty that Pierre was his father. It took her a few years to convince him to admit it, but she never doubted the truth. He only finally owned up to it when she had made it clear that she was done with him: “it was just a solitary mistake on the couch,” he said. She is very fond of this lovely photo, which predated this family, first formed in 1994. She dated the photo around 1988, after she and I had met (we worked in the same office!) but before any fluttering! In part because of her surprising revelations, and because of her evident vulnerability, those mysterious waves broke, bringing two people bobbing on the ocean, circling around each other more or less warily, together all of a sudden, in a crash of noise and spray. There was quite a while between those waves breaking in late 1991 and our finally getting together in March 1994. Throughout the entire time, I was in love with her, madly in love, blindly, hopelessly in love. It hurt all the time, mostly a dull ache, a constant reminder that she was not there, sometimes a searing burn, when she would no longer see me or talk with me because it was all too complicated. Which it was. It became a part of me, that pain, we spent so much time together that it became a kind of friend. I would acknowledge it and try to keep it under control and learn to relax with it and live with it. And then she was there, with me, and the hurt stopped. Moving in together brought a kind of ease. She was there when we drove to the supermarket or picked up the children at school, she was there in the living room in front of the TV in the evening, and she was there every night. I would stop and look around every so often and wonder where that dull ache was, the one that I had become so accustomed to, and then I would remember that she was there. There was so much love, enriched by the joy of discovery and of finally having her there by my side. When intimacy has been yearned for for so long, it is doubly satisfying. 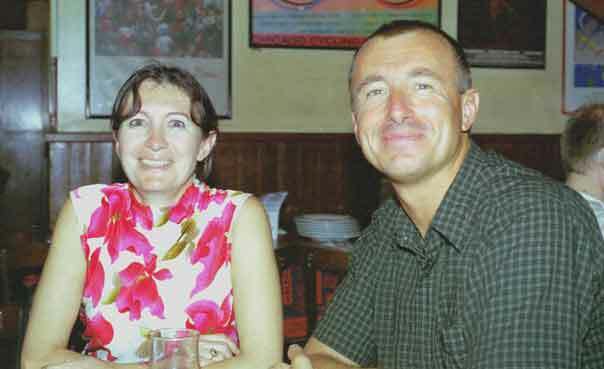 With her brother Denis at the Chicago Pizza Factory on the Champs Elysees in Paris in August 2003 during our summer vacation that year. To prove the point, Marie-Hélène was pregnant within three months, and Charlie arrived in August 1995, sealing the deal as it were. Next came 1997 and our wedding: these things don’t necessarily happen in the expected order in France! Then Alex arrived in 1998, and our family was complete. And none of it, none of our sixteen years together, would have happened if we hadn’t weathered all those difficulties, all those social and cultural barriers, and made it work. Having been pretty positive here, despite the years of relentless time-consuming divorce hearings (they really have gone on to excess), I will now permit myself a tiny response, in the form of a few less than entirely flattering photos. This seems justified because I already did the same to myself here. Balance in all things, even teasing! 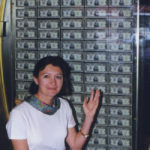 And speaking of divorce hearings, here is their precursor, Marie-Hélène sitting in front of a million dollars in Las Vegas! She owns real estate worth well over that by now, but you’d never know it in those hearings!! Something’s already wrong here. It’s late 2004. Tom became our most estranged child during his high school years, and left us for good soon after graduating. Wonder why, after such a wonderful start. Her father was a professional photographer, and I was constantly running around taking pictures. Inevitably, refusals to be photographed occurred, and were entirely justified. This is my favorite, because it conveys a certain elegance. Nope, can’t stop there, can we! Here she is with Charlie, doing what she did best, being maman. Christmas Eve, 2005 in our salon: for the good times!